There are many different ideas floating around the industry on what it takes to be a good diesel mechanic. Some might feel that having the ability to switch out some broken parts, change oil and throw some grease in a U-joint are all it takes. However, what a diesel mechanic was in the past is not what a diesel mechanic is today. Technology on trucks running down the road has drastically changed over just the last 10 years and continues to evolve today - from a six-cylinder engine with two to three Engine Control Modules (ECMs), to the more current P4 2019 Freightliner Cascadia truck, which has 15 to 20 different ECMs communicating at once. This change in technology means many of the important diesel mechanic skills are also changing. At Schneider, we look for eight qualities in the diesel mechanics we hire. 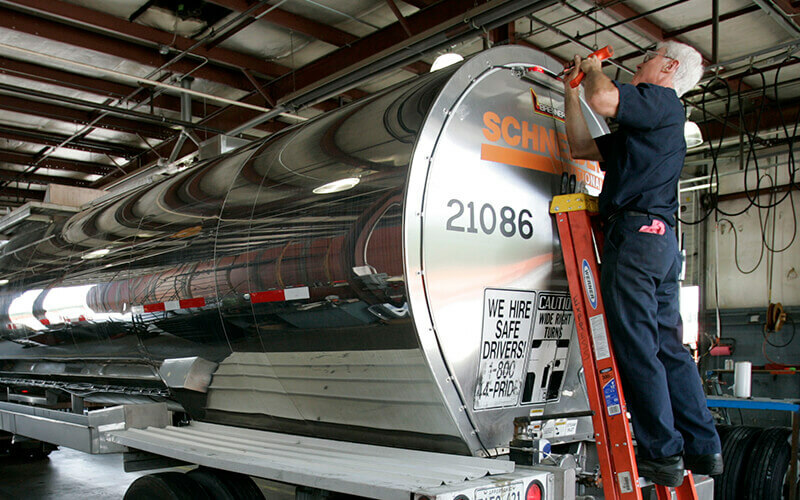 At Schneider, we believe every accident is avoidable. We want our diesel mechanics to go home as they came in to work. This requires our mechanics to follow all safety procedures set forth by the company and to watch out for their teammates. Being safety-oriented includes: wearing all the proper personal protective gear, cleaning your work areas and other surrounding areas and properly using the correct tools for the job. Being a diesel mechanic includes working in a fast-paced environment with unexpected challenges. Being alert prevents accidents from happening and results in a higher quality of work. Furthermore, being present and on-time for your shift helps the shop and your team complete scheduled and unscheduled work. Our task is to keep the fleet moving, and that’s difficult to do when mechanics are tired and late for their shift. Being a good listener may not be on a lot of diesel mechanics’ list of important skills, but it is a trait that is used in many different areas of the job. First, it is important to understand what a driver is telling you, the mechanic, about his truck, including what time he needs the work to be done by. 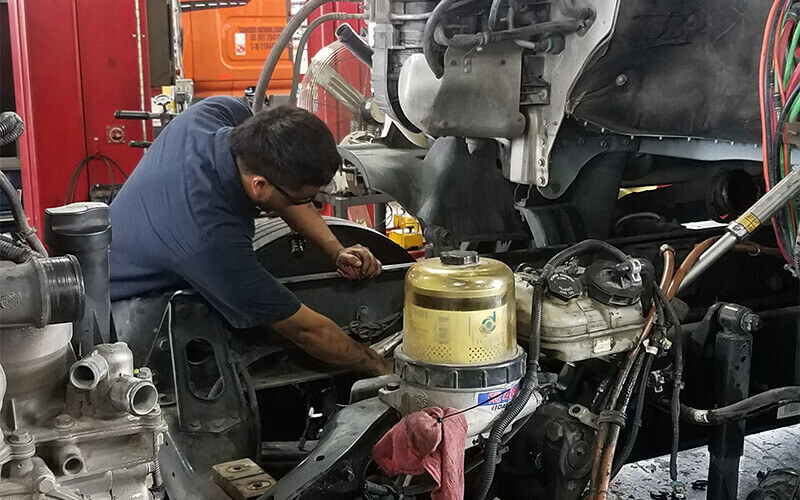 Diesel mechanics at Schneider are constantly working as a team, and being able to communicate with another mechanic includes being a good listener. It could be communicating about the diagnostics of a truck or conversing about finding an air leak, fuel leak, water leak, pressure within the engine, etc. Being a team player is a big part of working at Schneider. We all work within the team, from Corporate, to leaders, to drivers, to technicians, and having the ability to share information and listen to new associates is a valuable quality to have. Schneider is always looking to invest in new technology, as it helps us stay competitive in the market. With new technology comes new tooling, and Schneider is not afraid of investing what is needed to get the job done. Having the willingness and excitement to learn new things is what’s key. Schneider offers on-going training and advancement opportunities to their diesel mechanics. You will find that majority of our current Shop Floor Leaders were former mechanics. We are looking for mechanics who want to learn and are open to the different trainings that we offer. To become a good mechanic, you will need to be up to date and certified on the different engines and technology that we run. Today’s mechanics are constantly working with laptops; better than 50 to 60 percent of their day is looking at diagnostics, troubleshooting codes and running different tests on the engine, fueling systems and after treatment. This is very different from what mechanics were doing just a few decades ago. The job entails sending emails, filling out work order notes, detailing the work you have completed and typing out warranty, complaint, cause and correction notes. It also means working with other team members from different shops and Corporate through Skype. Everything that Schneider’s mechanics need is stored in computer programs created by Schneider, Detroit, Cummins, PACCAR, Volvo, International, etc. Using these programs gives you the information you’ll need to do your job. No matter if you are master technician or an assistant, you will face situations where things don’t go exactly as planned. There will be deadlines to deal with and units that are under load and needing to leave the shop quickly. Thinking outside the box to complete a job, observing other mechanics and having the ability to take a step back and not lose your cool when something is not working correctly are all keys to being successful. Having quality tooling plays a vital role in being a good mechanic. As you progress in your career, you will have the opportunity to invest in new tooling. Although purchasing higher quality tools is more expensive, it will mean completing your job safely, on time and correctly the first time. If you’re a new diesel mechanic who’s just starting out, we recommend creating a tool list. You will be required to install different components in hard-to-reach areas, like tightening torque bolts to a certain specs and removing components of different weights. The better tooling you have, the easier these tasks will be to complete. Do you have what it takes to be a diesel mechanic? If you possess some or all the traits mentioned in this blog, then a diesel mechanic position at Schneider could be the perfect fit for you. Search for the open positions we have available at our shops around the U.S.